The Law Society of South Australia has launched a new Charity Partnership with the Royal Adelaide Hospital (RAH) Research Fund for the next three years. To launch the partnership, a special Member networking event was held on Thursday 5 July 2018 at the RAH Lecture Theatre (level 8) where guests were given a behind the scenes tour of the hospital, featuring the Automated Guided Vehicles (AGVs). Members heard from the Law Society’s President, Tim Mellor, and Central Adelaide Local Health Network (CALHN) Chief Executive Officer, Jenny Richter who welcomed the crowd and spoke about the remarkable fundraising efforts that the RAH Research Fund has provided the hospital over the past 35 years. For further information, visit the Royal Adelaide Hosptial Research Fund website. 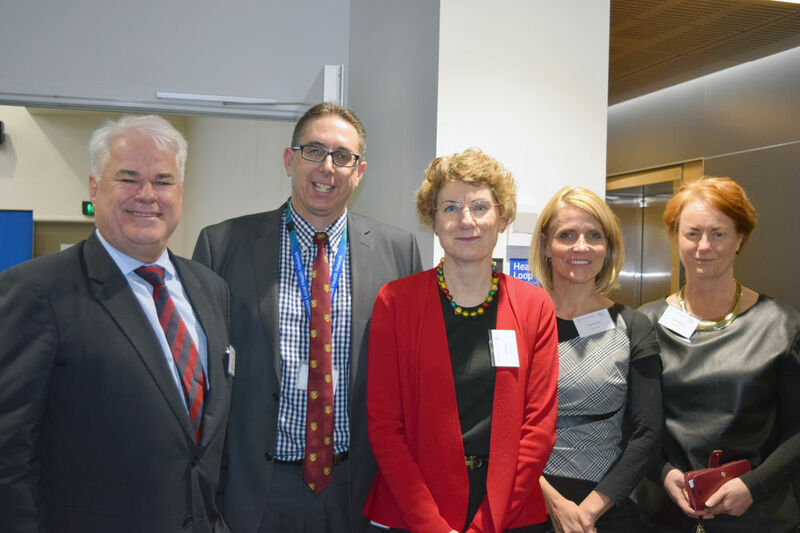 Tim Mellor, President of the Law Society of SA, Simon Blight CALHN Fundraising Manager, Jenny Richter, CALHN Chief Executive Officer, Clare Feszczak, former CALHN Director of Operations and Helen Chalmers CALHN Chief Operating Officer.